Come knit, spin, chat and/or shop. 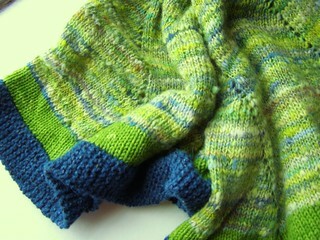 Come learn how to attach a simple garter stitch edging to a piece of knitting. This will get you ready to do any edging, lacy or otherwise. Same basic principle. Come enjoy the yoga stylings of knitter and yogini Sharon Rudyk of Yoga Matrika. We will be emphasizing stretches designed to get knitters limbered up and knitting better than ever! Where I will be teaching Embroidery on Knitting and Beginning Spinning – Drop Spindle. Because of the classes I am teaching at Pgh Knit and Crochet, I am not teaching at the Studio this month. You can look forward to more classes in April. 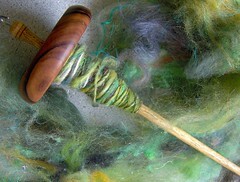 I am planning to at least have a drop spindle class in April – I have several folks interested. If you are interested, please let me know!! That way I can coordinate all of us and find a time that works for everyone. I am sad to announce the closing of the studio at the end of April. It is the end of an era, but don’t worry! I’ll have my home studio set up for people to come buy yarn and I am planning to teach at Crazy Mocha in Squirrel Hill. I have had enough people still want to take classes that I thought it was worth it. If you have a class you’d like to take from me, please let me know and once I have a couple of people, I’ll put it on the schedule! Classes coming soon: Beginning Spinning on a Drop Spindle, Baby Sweater Design, Baby Surprise Jacket, and Cast ons and Bind offs. This entry was posted in classes, community, cosyknitsliterally, studio by cosymakes. Bookmark the permalink.